Lok Sabha Elections 2019 will be held in seven phases starting from April 11 and will continue till May 19. The counting will take place on May 23. Lok Sabha Elections 2019: BJP releases list of 4 candidates for Odisha assembly elections, fields Murali Sharma from Champua, Manash Mohanty from Bhograi, Raghunath Mohanty from Basta and Chhabi Mallick from Niali (SC). Lok Sabha Elections 2019: Election Commission issues notice to Uttar Pradesh Chief Minister Yogi Adityanath over his ‘Modi ki sena’ remarks, made during a speech. The Commission has asked him to file a reply by April 5. 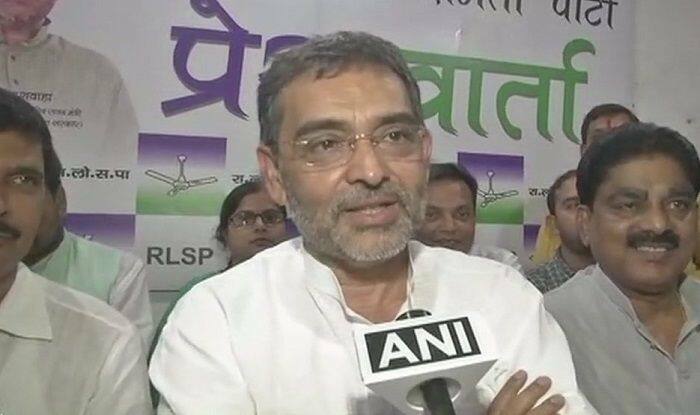 Lok Sabha Elections 2019: Rashtriya Lok Samta Party Chief and former Union Minister Upendra Kushwaha to contest from Karakat and Ujiarpur in Bihar. Lok Sabha Elections 2019: PM Modi rips into Congress in Kolkata, says that the party, in their manifesto, has stated that they will dilute AFSPA. “This move will help Pakistan sponsored terrorist. The Congress is determined to bring instability in the country,” he said. Lok Sabha Elections 2019: Congress wants to weaken the forces, they want to compromise the national security, said PM Modi in Kolkata. Lok Sabha Elections 2019: PM Narendra Modi addresses rally at Brigade Ground in Kolkata, slams Congress. He said that the party is attempting to ‘help’ Pakistan with its manifesto. “The party has had a soft-corner for those who practice terrorism,” the PM said. Lok Sabha Elections 2019: Meanwhile, PM Narendra Modi is addressing a rally in Siliguri of West Bengal. Targeting CM Mamata Banerjee, he says that the development of the state has been hit by a ‘Didi’ speed breaker. Lok Sabha Elections 2019: RSS, BJP and PM Narendra Modi want to divide the nation. They spread hatred. On the other hand, the Congress wants to unite the nation. The party wants to spread harmony and brotherhood, says Rahul Gandhi in Assam. Lok Sabha Elections 2019: Rahul Gandhi addresses rally in Assam, assures industrial policy and special status to northeastern states if voted to power. Lok Sabha Elections 2019: PM Modi attacks Congress and calls its manifesto as “Dhakosla Patra”. WATCH Video. New Delhi: In a major push to the Bharatiya Janata Party’s Lok Sabha election campaign, Prime Minister Narendra Modi is set to conduct two rallies in West Bengal on Wednesday. So far, the Prime Minister has conducted three rallies in north Bengal’s Cooch Behar, in Dalit Matua community-dominated Thakurnagar in the North 24 Parganas and in West Bardhaman district’s industrial city Durgapur of the state. On Wednesday, Modi will first address a rally in north Bengal’s Siliguri, followed by a rally at Kolkata’s iconic Brigade Parade Ground. The BJP, which won only two seats in Bengal in 2014, aims to substantially increase its seat count in the state under its “Look East” policy. Meanwhile, West Bengal Chief Minister Mamata Banerjee on Tuesday said that political parties should concentrate on implementing their poll promises properly. Further, she claimed that the Trinamool Congress had fulfilled most of the promises made in the previous polls. Banerjee lost her cool when asked whether she advanced her campaign meetings at Dinhata from April 4 by a day keeping in mind the meeting of Prime Minister Narendra Modi at Siliguri on the same day. “Don’t ask me such questions. Don’t teach me. It may suit you but it may not suit me,” she said. Banerjee said she was asked to do an extra meeting and that is why she will campaign at Dinhata. Notably, Congress President Rahul Gandhi will address three back to back election rallies in Nagaland and Assam on Wednesday. Rahul will address the first rally at Dimapur in Nagaland on Wednesday morning. He will address the second rally at Bokakhat in Assam’s Golaghat district for sitting Kaliabor MP Gaurav Gogoi, followed by the third rally at the state’s Lakhimpur district for party candidate Anil Borgohain from Lakhimpur constituency. On Tuesday, the Congress released a 53-page manifesto for the polls with a slew of promises such as good governance, freedom from indebtedness to farmers, protecting existing jobs while creating new ones and implementing anti-corruption laws without bias. Besides, the Congress party also promised to launch MGNREGA 3.0 to address issues of water security, soil quality and similar issues that aggravate farmers’ distress.